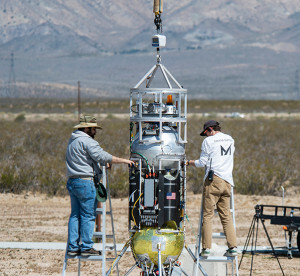 Masten Space Systems’ technicians prepare their Xodiac rocket to flight test Honeybee Robotics pneumatic sampler collection system, PlanetVac, in the Mojave Desert. Just a sample will do. 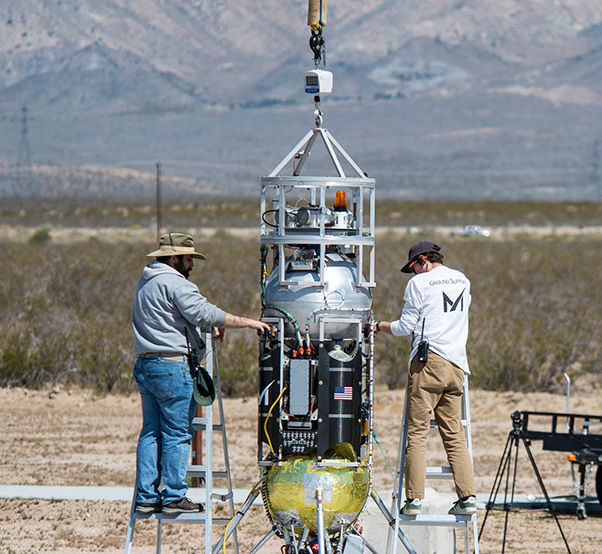 Honeybee Robotics in Pasadena, Calif., flight tested its pneumatic sampler collection system, PlanetVac, on Masten Space Systems’ Xodiac rocket on May 24, launching from Mojave, Calif., and landing to collect a sample of more than 320 grams of top soil from the surface of the desert floor. PlanetVac is a surface soil collection system for a sample return mission. The configuration tested would replace a foot pad of a planetary lander spacecraft. The goal is to bring back a sample of surface soil from a celestial body. The pneumatic sampler foot pad starts operation after the lander touches down on a surface. Compressed gas is injected into the foot pad enclosure, lofting the soil into a cyclone separator for collection. 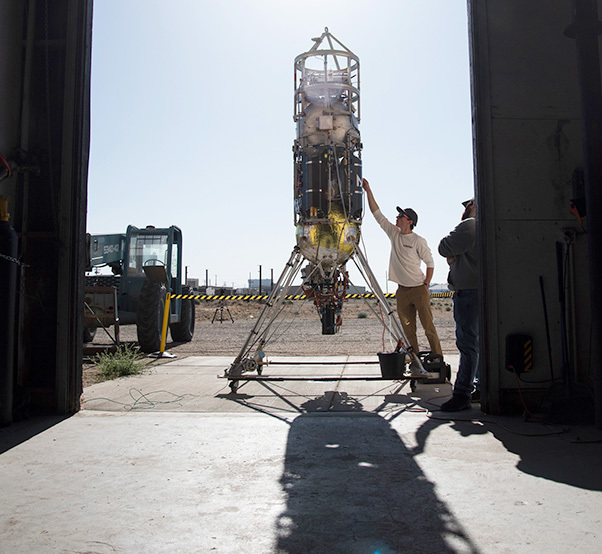 Masten Space Systems technicians checking Xodiac rocket after sliding it from the company’s facility in preparation to flight test Honeybee Robotics sample return technology. Through the Flight Opportunities program, the Space Technology Mission Directorate (STMD) selects promising technologies from industry, academia and government for testing on commercial launch vehicles and enables public-private partnerships for the agency. The program is funded by STMD and managed at NASA’s Armstrong Flight Research Center in Edwards, California. 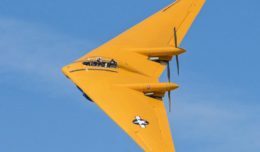 For more information about the Flight Opportunities Program, visit http://www.nasa.gov/flightopportunities. For more information about the Space Technology Mission Directorate, visit http://www.nasa.gov/spacetech.